The WT3000E represents great improvement over previous models in terms of power factor error (it is approximately three times more accurate). With improved measurement accuracy in the lower power factors—such as with transformers, active power values can be measured with higher precision. 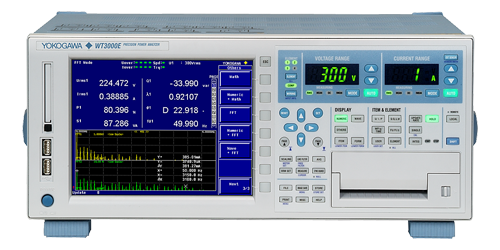 RMS (the true RMS value) and the mean (rectified mean value calibrated to the rms value) can be measured at the same time, allowing for measurement of corrected power (Pc) and other measurements conforming to transformer evaluation standards. * Current rms and current mean can not be measured simultaneously. The built-in delta computation function allows both star-delta and delta-star conversion. For example with delta wiring, you can check the line voltage and phase voltage simultaneously without changing the wiring.